Great time had by all at Kings Park Do It Best Hardware on January 15th where members of the Design Cartel presented: Affordable Kitchen Makeovers. Yes, you read it right, AFFORDABLE Kitchen Makeovers are possible! Designers are trained to "think outside the box" and we happily shared some of our tips to help you redo your kitchen for less! It's all about Repurpose, Reimagine and Reinvent. 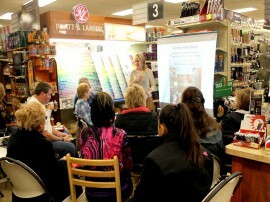 Hope to see you at our next Design Seminar - and for all who attended, thank you. You made the night a memorable experience! Check out what Kings Park Notebook's blog about our event.